After playing indoors at the AT&T stadium in Dallas for the last three years, it is time to take the show to an outdoor venue - Nissan Stadium in Nashville, Tennessee!. On July 15th, Dynamic Discs will plant a basket on the 50 yard line on the field where the Tennessee Titans play football. 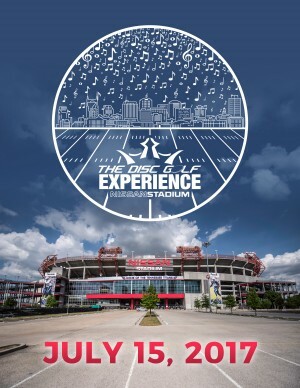 Nine holes of unique disc golf will be set up inside the stadium. This opportunity is offered nowhere else. Along with the incredible experience offered, there will be an awesome player's pack with a few one-of-a-kind discs. Will you be there to listen to your name being announced on the first tee or will you listen to everyone else tell their stories of how they had a "titan" shot in Nashville? A. The VIP package will include tee times between 3PM and 4PM. At the end of the evening, VIPs will be able to attend an exclusive party in the upper terrace of the stadium with a spectacular view of Nashville. VIPs will also have the opportunity to throw a special CTP hole from the upper terrace to the 50 yard line! Drinks and light fare will also be provided for the VIPs! VIPs will have first priority to purchase the actual portable Patriot baskets used in the stadium for the event. VIPs will also be joined on a few of their holes by Dynamic Discs sponsored professionals. A. Tuesday, May 16th at 6:00 p.m. Central. A. They will need to purchase the Player Pack Experience ($40) which allows them to be on the course. Dynamic Discs is responsible for all refunds/cancellations. If you need to cancel for any event, it must be made by email to [email redacted]. Cancellations more than 7 days in advance from the event will receive a full refund minus a $5 processing and cancellation fee. Cancellations under seven days from the tournament date will be refunded in merchandise equal to the entry fee minus a $5 processing and cancellation fee. Cancellations after July 14th will not receive any refund.